ThermTech approached Polyflor with a proposal to install a pilot plant that could be used to evaluate the technology. However, the efficiency with which Electrostatic Precipitators can remove solids, moisture and thermal degradation products from flue gases causes the precipitator and its associated gas cooling equipment to eventually become blocked. This requires them to be cleaned, sometimes off-site, which until now, resulted in downtime for the manufacturing process they are associated with. Successfully winning a government development grant, ThermTech manufactured the prototype equipment and installed it at Polyflor’s Manchester site, where it was connected to a stream of flue gas. 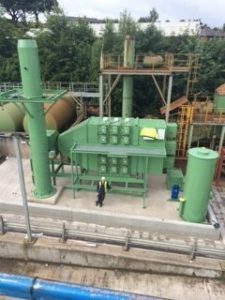 Over a period of several months the process was fine-tuned until the Electrostatic Precipitator cells could be washed periodically, or on demand, automatically and be brought back online within 2 minutes of the cycle ending.